Diamond shaped traffic signs give instructions to tram drivers. 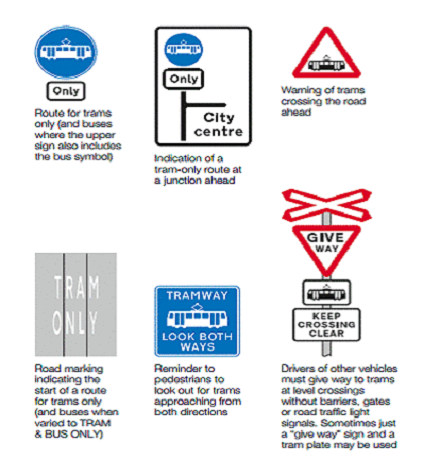 The exact meanings of tram signs and tramway signage is part of the UK Highway Code. TRAM ROAD SIGNS: How would you identify a section of road used by trams? As a rule, all tram road markings are a diamond shaped road sign. Learning the Highway Code road signs and their meanings is the law. 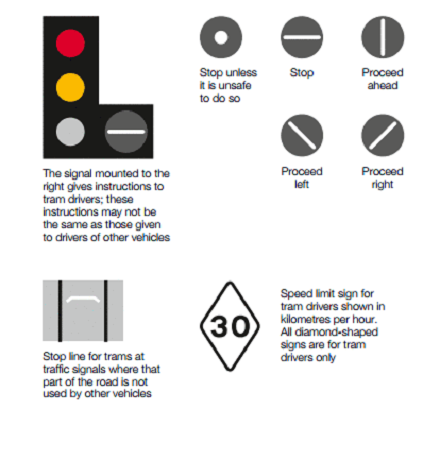 Tramcar drivers and road users get highway instructions from tram signs. Thus, all drivers and riders should obey diamond-shaped traffic signs which often have white light signals. Motorists need to be clear how these less common diamond shaped signs give instructions to who, and why. You will then understand the special circumstances for the tram signs Highway Code. That will help you develop good anticipation of the movement of trams on the lines. Always prepare to give way at diamond shaped traffic signs and tram road signs and markings. The slow moving electric streetcar may have the right to move through tram area markings when you are not. Never try to race past trams, overtake them, or pass them on the inside. But, it may be appropriate to move passed them while they are stationary at tram stops. There is often a designated tram lane for you to pass through once they have stopped by the tram sign and signals. All diamond shaped road signs are for tramcar drivers only. As a rule, the route for trams only sign (and buses) are blue road signs. This tram signage has a blue background with the upper sign displaying the tram symbol. A rectangular tramway sign with a blue background displaying the term 'look both ways' reminds pedestrians to look out for trams approaching from both directions. The give way to trams sign means drivers of other vehicles must give way to trams at level crossings without barriers, gates or road traffic light tram signals. Often only a 'give way' sign and a tram plate gets used. Tram speed signs and maximum speed limit signs of the Highway Code for tramcar drivers will get shown in kilometers per hour. You will recognise the trams must stop sign as a gray circle with a horizontal white line running through the center. Tram traffic lights often have signals mounted to the right. This signal gives instructions to tram drivers. The directions may or may not be the same given to other motorists. How are the Reserved Areas for Trams Marked Differently? In general, areas reserved for trams and tramways in the United Kingdom will have white line markings. They will be a different coloured surface and a different surface texture. What is Roadside Emergency First Aid? Rendering emergency first aid at a road accident is a temporary procedure until EMS arrive. Being prepared means always carrying a first aid kit and getting trained in first aid emergency response skills. What is the UK Driving Speed Limit? The Association of Chief Police Officers regulate the speeding maximums in the UK. It does not represent safe driving speed limits for all situations on all highways. What are the Rules for Riding Horses on UK Roads? Check the pavement rules, regulations for horseback riders, and operators of horse-drawn vehicles. All vehicles pulled by a horse should display two red reflectors on the rear of the carriage.